• Compact receptacle for F5 iButton mounting. • Fully backward-compatible to DS9098. • Contacts are stainless steel with selective tin lead plating for optimal solderability. • Retainer to iButton connection is stainless steel to stainless steel. • Withstands up to +250°C for surface mounting. • Double redundancy of contacts (2 plus 2). • Contact force exceeds 2N for reliable connection. • At insertion, the iButton is latched for retention. • The iButton pops up for removal when latch is released. • Gentle deflection of latches allows removal of the iButton. • >25 insertion/withdrawal cycles with no performance degradation. • Compatible with standard pick and place equipment. • Cleaning fluids drain freely for quick clean up. The DS9098P+ iButton Retainer is a low-cost, surface-mount device to secure a F5 iButton on a printed circuit board. It consists of three metal pieces (two for ground, one for data) molded into a body of black, heat-stabilized, 30% glass fiber reinforced Nylon 46. When inserting an iButton into the DS9098P+, closely align axis of the iButton and the retainer. 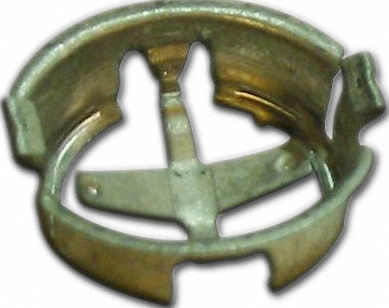 The retainer then latches the flange of the iButton. At removal, limit deflection of retainer latches to just free the iButton edge from retained state. Avoid applying excess force to latches. The DS9098P+ is only available on tape and reel. The tape specifications match those of 68-lead PLCC devices except for the deeper pockets and tape-feed sprockets on either side of the 44mm tape. Alignment pedestals keep the part oriented on tape with the latches adjacent to the sprockets.